The envelope proteins are in shown in yellow and red with glycosylation in turquoise. Portions of the membrane protein, in magenta, can barely be seen through the cracks between envelope proteins. Zika virus was discovered in 1947, in an infected monkey in the Zika Forest of Uganda. By all expectations, it would have remained a virological oddity like other obscure tropical viruses transmitted by mosquitoes. However, study of Zika virus has gained new importance because of the recent spread of the virus in many countries around the globe and its connection to birth defects and a rare neurological disease. Cryo-electron microscopy has been used to reveal for the first time the near-atomic structure of Zika virus (PDB entry 5ire). The virus was isolated from an infected patient and grown in larger quantities in cell culture. The structure was then determined by aligning over 10,000 images of the virus, building a detailed cryo-EM map that shows the folding of the two proteins on the surface of the virus: envelope (E) protein and membrane (M) protein. You can take a look at the map at the EMDataResource website in entry EMD-8116. The structure reveals that Zika virus is similar to other flaviviruses, such as Dengue virus and West Nile virus. Its outer surface is tiled with a tightly-packed coat of envelope proteins. The cryo-EM structure also revealed that an asparagine amino acid on the surface of this protein is glycosylated. These carbohydrates are thought to be the way that Zika finds the cells that it infects, by binding to carbohydrate receptors on the cell surface. When the structure was determined, the cryo-EM map was averaged based on icosahedral symmetry to sharpen the image of the surface proteins, but the details of molecules inside were averaged out in the process, since they do not have icosahedral symmetry. However, we can speculate about what it might look like based on other studies of the virus. The envelope and membrane proteins are embedded in a membrane that is taken from an infected cell when the virus buds. Inside this, a single strand of viral RNA is associated with many capsid proteins that chaperone the RNA genome through the process of assembly and infection. 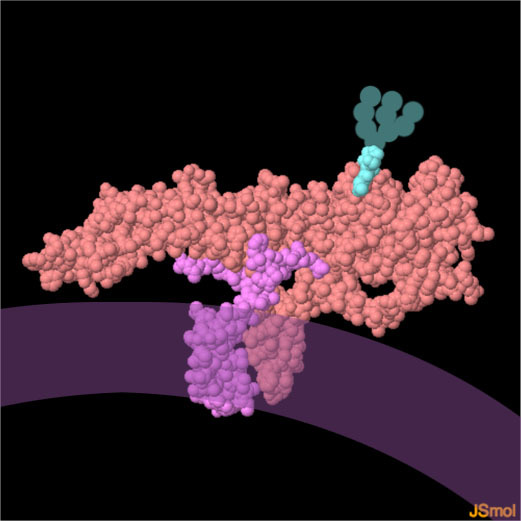 The cryo-EM structure includes atomic coordinates for the envelope protein (red) and the membrane protein (magenta). 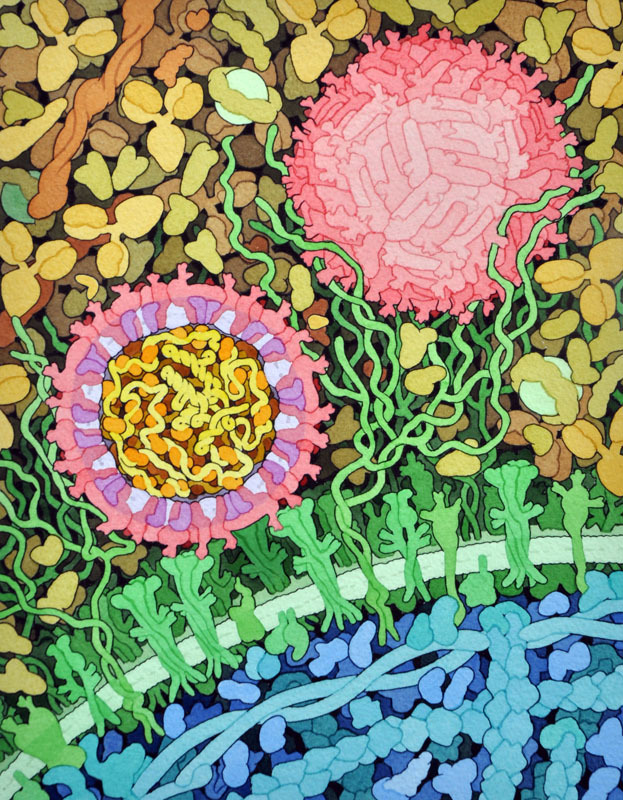 The entire virus includes 180 copies of these proteins, but only one of each are shown here. Both proteins have a loop that is embedded into the membrane. The structure also includes the first two sugars of the carbohydrate attached to an asparagine amino acid in the envelope protein. To explore this structure in more detail, take a look at the interactive Jmol using the button above. The PDB archive includes many structures for other flaviviruses. To find them, try searching on the main RCSB PDB site for “Dengue” or “West Nile”. 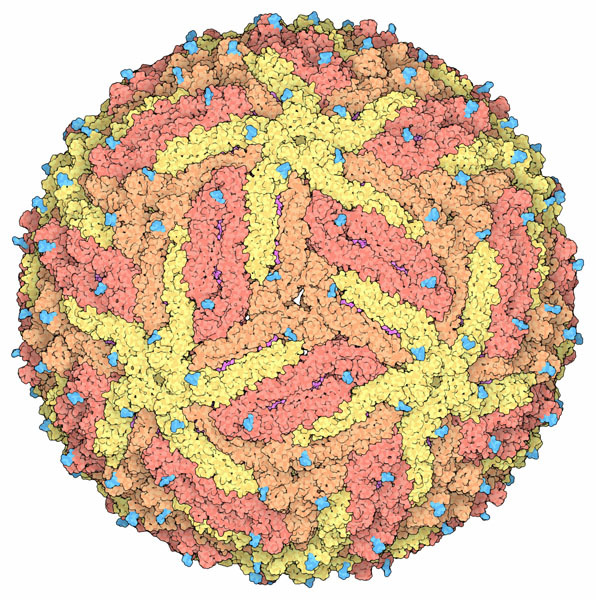 A paper model of Zika virus is available at PDB-101. 5ire: D. Sirohi, Z. Chen, L. Sun, T Klose, T. C. Pierson, M. G. Rossmann & R. J. Kuhn (2016) The 3.8 A resolution cryo-EM structure of Zika virus. Science 10.1126/science aaf5316. T. C. Pierson & M. S. Diamond (2012) Degrees of maturity: the complex structure and biology of flaviviruses. Current Opinion in Virology 2, 168-175. S. Mukhopadhyay, R. J. Kuhn & M. G. Rossmann (2005) A structural perspective of the flavivirus life cycle. Nature Reviews Microbilogy 3, 13-22.